It is really ridiculous when someone talks about how important the environment is & raves on about what he did during Earth Hour just to retreat to the nearest air conditioning unit after speaking & breathe a sigh of relief after turning it on to its highest setting. Suddenly, I realise that Malaysians are ADDICTED to Air-Con! At schools, too hot cannot study so use the fan to the max. At tuition, must have air-con or cannot study. At work, we need the air-con or we cannot work. At home, we must on the air-con or cannot sleep la. We will choose the most air-conditioned path to our destinations. 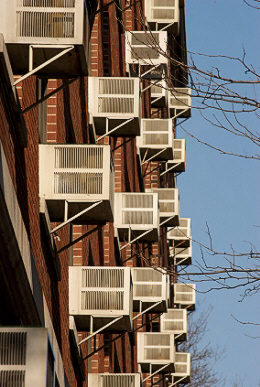 We will often rush from air-conditioned building to air-conditioned building. We pant & fan ourselves in our 2 layer designer clothes after escaping the harsh tropical heat into an air-conditioned heaven & watch in wide-eyed admiration as a drenched & baked AngMoh dressed in simple shorts & singlet walks past outside. Air conditioning has become a necessary part of our lives & there is nothing wrong with that. I am a fellow Malaysian & a fellow victim of the unbearable heat. However, the air-con is an energy guzzling machine so we need to be mindful of how we use it. Some Malaysians like to sleep in a freezing room with a thick duvet/blanket. Are you trying to preserve meat in your room? Or do you want to experience winter? Please don't waste. Save the money on your electricity bill for an actual trip. If you are in your study or living room & the air-con is too cold for you to be comfortable without 2 layers of clothing, turn it down. In your bedrooms, tune your air-con to a comfortably cool temperature & keep it there for the rest of the night or, even better, set it to turn off after a few hours. It's time we put all this talk about energy conservation, going green, loving our environment, carbon dioxide emission reduction, karma & so on into action in our daily lives. We are after all borrowing this earth from the future generation.